WASHINGTON (AP) — First lady Michelle Obama isn't the first national leader to try to get America's kids off the couch. President Dwight D. Eisenhower tried more than 50 years ago, and it's been a losing battle since. Childhood obesity has been on the rise in recent decades, with 17 percent of children considered obese and about one in three of them overweight. Which means Mrs. Obama has her work cut out for her, much as Eisenhower did when he created the President's Council on Physical Fitness and Sports in 1956. The presidents who followed him took on the struggle as well. "Efforts like the president's council have been overwhelmed over the years by trends in society that push kids in the other direction," said Russell Pate, a professor of exercise science at the University of South Carolina. He cited a "triple whammy" — the advent of video games, the reliance on cars to get around and the rise of a high-fat, fast-food diet — that undermines a healthy lifestyle for kids. 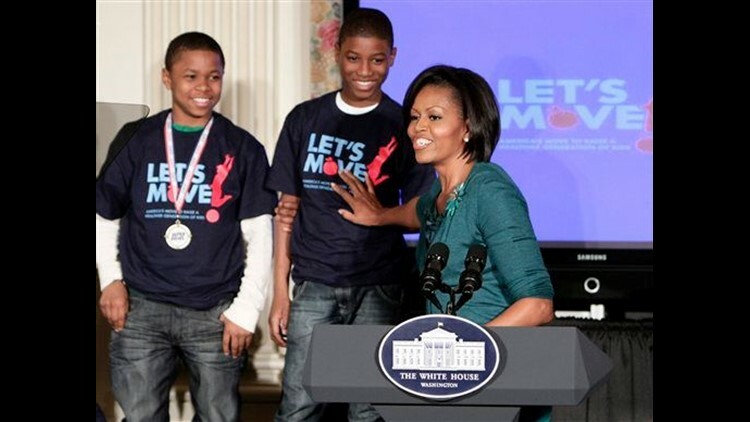 In announcing her "Let's Move" campaign Tuesday, Mrs. Obama made clear that physical fitness is key to what she's trying to do and that there is a role for the Eisenhower-era fitness council. The administration will upgrade the council's Physical Fitness Challenge, she said, and give awards to kids who engage in physical activity five days a week for six weeks. Besides getting kids to exercise, Michelle Obama's campaign aims to help parents and schools make better food choices and make healthy food more available and affordable. The fitness council's 20 volunteer members are charged with encouraging physical activity, fitness and sports programs. Like his predecessors, President Barack Obama has preserved the council, although he has not named any members yet. Obama also created a child obesity task force that will work alongside it. "Obesity has been recognized as a problem for decades, but efforts to address this crisis to date have been insufficient," Obama said Tuesday. Tom McMillen, a former congressman, NBA player and co-chairman of the fitness council, said the presidential council, with its $1.2 million budget, has been unable to really make a dent in childhood obesity because it lacks sufficient funding. Adding to the problem, McMillen said, is that unlike most nations, the U.S. lacks a ministry of sports. "What we've done instead is build stadiums. There's been nothing for the grass roots," McMillen said. "And the council, with its small size and budget, has been a non-factor." Eisenhower, alarmed by 1950s research that showed American youth lagging in a host of fitness measures, convened a White House event with government officials, medical researchers and sports personalities. The White House gathering led to the President's Conference on Fitness of American Youth, held at the U.S. Naval Academy in June 1956. The following month, Eisenhower created the President's Council on Youth Fitness, which eventually was renamed the President's Council on Physical Fitness and Sports. John F. Kennedy, who brought a youthful athleticism to the White House, sounded an even more foreboding tone as president-elect in "The Soft American," a December 1960 cover story he penned for Sports Illustrated. Kennedy linked Americans' lack of physical fitness to the Cold War, calling it "a menace to our security." During his presidency, the council ran advertisements encouraging people to exercise, including one that showed a man with a bulging belly next to the headline, "Is this the shape of things to come?" "Under President Kennedy, the president's council had a lot of pizazz to it," said Sen. Mark Warner, D-Va., who has sponsored legislation that would establish a nonprofit charitable foundation to raise private funds for the fitness council, a move long advocated by McMillen. "It's been less appreciated while the problem has grown exponentially." Over the years, the president's council has been led by celebrities from legendary Oklahoma University football coach Bud Wilkinson under Kennedy to Arnold Schwarzenegger under President George H.W. Bush. Schwarzenegger, now governor of California, bought a private jet and flew around the country at his own expense, making a point of visiting all 50 states. Richard Nixon, who as Eisenhower's vice president was the first council chairman, told delegates at the 1956 conference, "We are not a nation of softies, but we could become one if proper attention is not given to the trend of our time, which is toward the invention of all sorts of gadgetry to make life easy." Along came video games, smart phones and iPods.